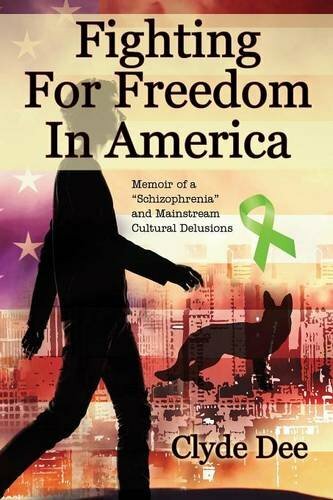 In “Fighting for Freedom in America,” author and mental health counselor Clyde Dee takes us on a journey, as he relives dealing with a broken system for the down-trodden, personal mental health issues from going off his medication, family and financial issues. His story is fascinating because he is able to intellectualize what he was thinking and feeling at the time, even if he is discussing his paranoid delusional thoughts. Clyde moves around quite a bit while trying to find employment. His mental health issues seem to hold him back from getting the perfect job, and he has a tendency to allow self-doubts to keep him from aiming very high. Being under or unemployed does not help him with his schizophrenia. Always feeling like he is being watched and followed, it is hard for him to know what is real and what is coming from his delusional thoughts. As Clyde gets back on medication and begins to get his life together, he really begins to start processing what he is experiencing. This includes his personal and professional relationships. It is fascinating to watch him evolve and become more aware than most people who are not facing his issues. Many lessons are taught in his story. I think that mental health workers must read this book. People who have friends and family members with mental health issues should also read this, because it will help them to see things from the other person’s perspective. As someone with a Master’s of Science degree in a counseling field, I have found my greatest lessons have been from real people and not material in textbooks. As I read Clyde’s story, I felt like I learned many lessons through what he has to share. My work will definitely be more beneficial by what I learned from him. For that, I am grateful, especially as I am getting more and more students who are dealing with mental health issues, and really need someone to understand what they are experiencing. “Fighting for Freedom in America” by Clyde Dee is highly recommended reading.